Critical feedback I received; Thanks to Anne Goodfriend, Su Ayun Kim and Uttam Gandhi! User need is clear but hard to identify what the product could solve, maybe explaining it through a user journey would be very helpful. Maybe needs some info/description about "Start a Set"? Audiences were overall confused about how it functions, and why it can be useful. It will be helpful to add solid description on landing page, or through question mark button. To understand the users of the Noun Project or similar icon search engines (aggregators), I came up with few questions and scenarios. Filtering out those who have experience with using an icon aggregator resulted a group of people who are in art/design industry. With the selected people, I proceeded the following questions and scenarios. Q. When you’re using the Noun Project or similar icon search engines, how many icons are you mostly looking for? Q. If you are looking for multiple icons, do you prefer them to be created by one person/designer? Q. Please briefly describe why you picked Y/N for the previous question. 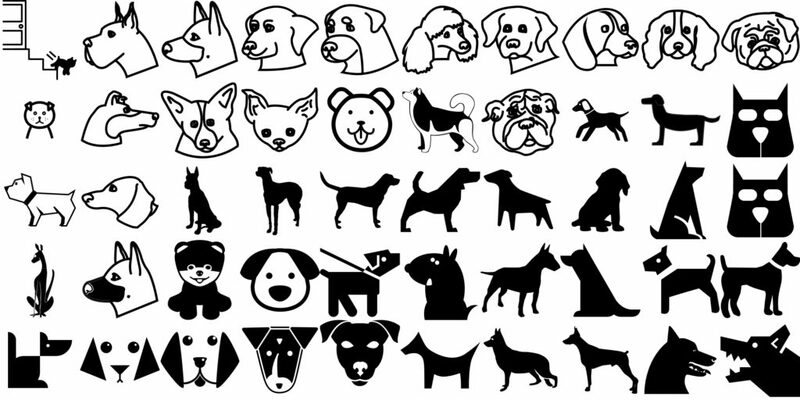 Y: consistency, same/similar style, overall accordance, uniformity, common theme, "already have a specific icon in my mind"
N: reference, "not for the right-away use"
S. You are looking for 2 icons: a dog and a cat. 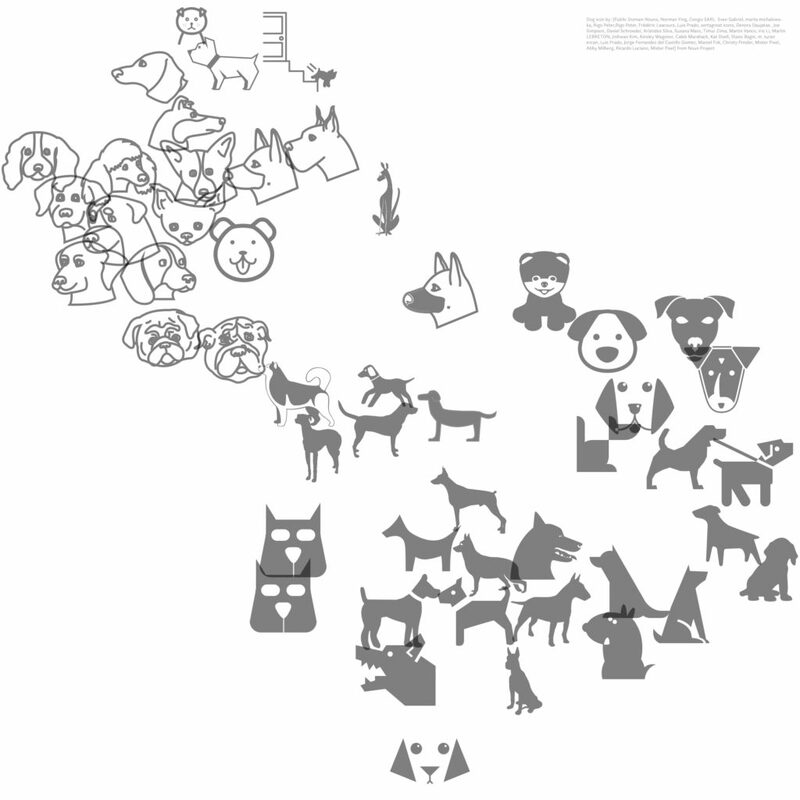 You found a dog icon that you like, but the creator’s collection only has icons of a dog. What would be your action? S. You are designing a website, and need 2 types of icons: a cake and a cat. Do you think this set of icons are good to be used together? Why? yes, they look same in style. Maybe the cat is too big? Yes. The two icons have used same background color and a line stroke. Yes, both in simple lines and fluffy. S. You are designing an app, and need 4 types of icons: flower, bicycle, cake and dog. Do you think this set of icons are good to be used together? Why? No. The bike icon's line stroke is too thin compare to the other three. Influential precursor projects, products, research, installations, performances and/or other influencers within which my thesis project sits. “Noun Project.” The Noun Project, thenounproject.com/. “Modern Pictograms for Lottie.” Airbnb Design, airbnb.design/modern-pictograms-for-lottie/. Salih Abdul-Karim, a motion designer at Airbnb, experiments various ways to create animation friendly icons -- or “artworks”, according to his description. He gives an idea what are the basic components of an icon, and further, what does the Noun Project's community aims to be, which is a collaboration between different people and overlapping practices. My project will be irrelevant from animating icon, but the article is inspiring in a way that it brings up the nature of the Noun Project's community. “Brandmark - the Smart Logo Maker.” Brandmark Logo Maker - the Most Advanced AI Logo Design Tool, brandmark.io/intro/. Brandmark uses deep learning tools to generate logos composed of an icon, typography and color scheme. It uses a convolutional net to filter out common symbols and shapes that are not "brandable", by giving legibility score and uniqueness score. Technically, it's exactly what I attempt to achieve -- except that I have different approach on sorting icons, as I'm not interested in making a single icon standing out as a unique logo. A pictogram, also called an icon, is an ideogram that conveys its meaning through its pictorial resemblance. For my thesis, I would like to design a search engine that effectively organizes pictograms by their visual similarities. Its goal is to help both viewers and producers of a visual system by maintaining consistency in pictograms. Pictograms vary in their level of details, scale, weight, and style depending on their themes and purposes. However, at least inside one system (i.e. a mobile application), they should align together; else they become mere doodles than a language by lack of consistency. It's a special subject to me, because I've been studying and working as a graphic designer and seen many users or designers getting confused about the subject. Providing clear way to categorize icons not only benefits the workflow of designers/producers, but also helps the viewers of that designed output, such as a presentation or a website. The final output will be a prototype of a web based search engine involving the Noun Project API, which has the largest icon database. Experts you have talked or plan to talk to? My thesis is heavily influenced by machine learning projects as Font Map or Quick, Draw! -- which both build relationship between visual elements by analyzing their patterns. Applying deep learning techniques to icons also has been done before (brandmark.io/intro/), but only for the purpose of "logo maker". It's great that I have many similar projects, so my research started from studying them. After studying the existing examples, I've learned that it is possible to sort pictograms. To start, I needed a large source of icons and I decided to use the Noun Project API, attracted by its high number of collection. Hence, my pictogram searching engine will be based of the Noun Project. The deep learning process is not only for designing the final search tool, but also to not arbitrarily pick icons for my research and user testing. During the process, I've already started conversation with some graphic designers about how they feel about the current method of searching icons. I'm also taking courses from Gene Kogan and Yining Shi, who are both experts in machine learning -- so I'll reach out to them for technical advice. The part that still needs to be found out is the portion of actual programming in prototype. While the final prototype will be built with Sketch toolkit to present my idea as clear as possible, its basic interface will be based of some working code. This is something that will be continuously adjusted throughout the research. Relevant Experience: If you don't have experience in a certain area, how have you planned on developing this skill? Please be specific as to what you have done to date, and your plan going forward. I have relatively little amount of knowledge about machine learning, and it's the core part for my research. To improve my understanding, I'm taking two other ML related courses. It's not that I'm trying to build a whole new type of convolutional net, and as I mentioned, there are many similar examples that already exist. My thesis is more centered around how to apply the existing technology to improve the Noun Project service, than inventing a new one. In case of technical difficulties, I'm planning to ask for advice from Gene and Yining, while I'm already gaining a lot of resources from Gene's course. 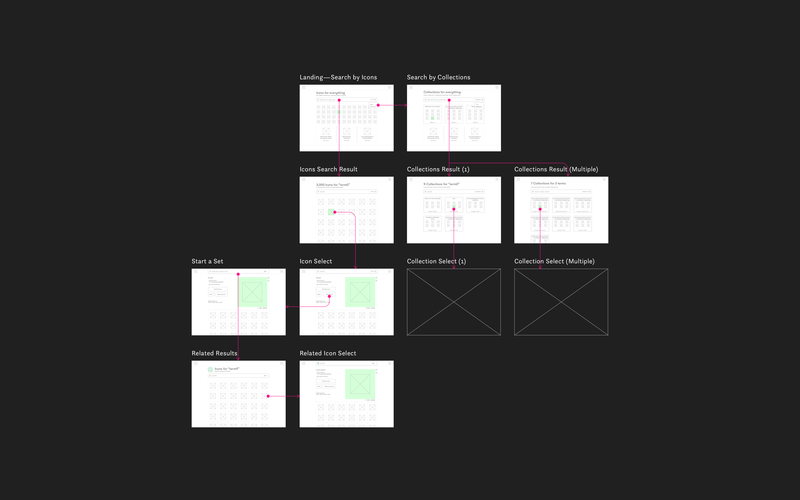 My thesis is composed of two big parts of analysis and prototype. The analysis part is pretty straightforward: I extract visual similarities from the Noun Project icons, and test if the viewers have easier time with the icon set in consistency, compared to the one without it. There are bit more unknowns in the prototype part, regarding how much programming will be actually done as a final output. The analysis will be visualized with at least two types of different icons, thus it can show the relationship between multiple terms. The prototype lets the users to pick multiple terms and get a set of icons with similarity, or change them altogether simultaneously. Alphabets vary enormously in characteristics such as their typography and structure. I've done a project about my bilingualism, and the biggest challenge for expanding the project was my ignorance about other types of alphabets. Even a single alphabet has its own complicated system (often deeply connected to its culture), and I would like approach my thesis in the point of visual perception, rather than focusing on a specific alphabet or a culture. Similar from the first reason, I would like to pick a language that is more universal and primitive. "A pictogram, also called a pictogramme, pictograph, or simply picto, and in computer usage an icon, is an ideogram that conveys its meaning through its pictorial resemblance to a physical object. 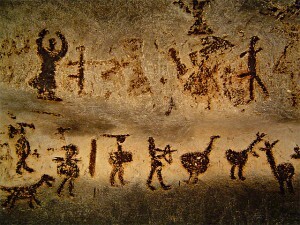 Pictographs are often used in writing and graphic systems in which the characters are to a considerable extent pictorial in appearance." A pictogram is somewhere between a primitive drawing and a letter; not only in their form, but also in their historical order. It's more systematic than a doodle, yet requires less abstraction and training than a letter. It's is a doodle, yet a "consistent doodle". "ISO 7001 ('public information symbols') is a standard published by the International Organization for Standardization that defines a set of pictograms and symbols for public information." For example, the international exit sign, "Running Man", was introduced into the 1987 standard as a consistent and international approach to move away from using words in the native language, after the Sennichi Department Store Building fire. Ferdinand de Saussure claims language is relational system of signs. One of the problems about a pictogram is that it's much diverse in style and interpretation of what it signifies. 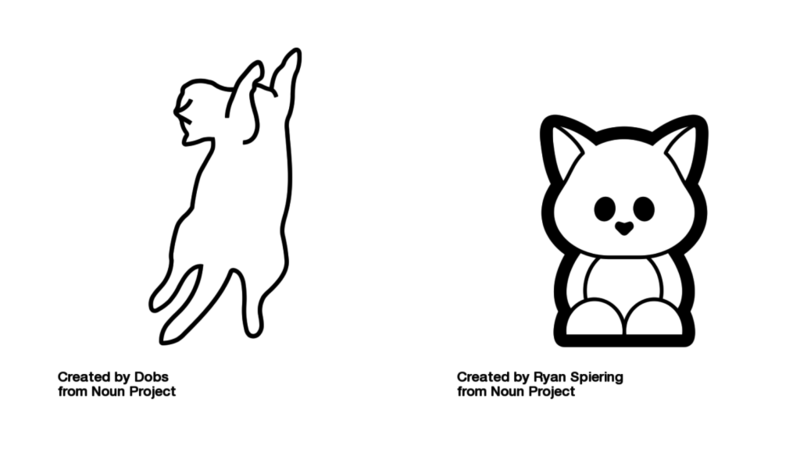 These two icons are both from searching "cat" in the Noun Project. The Noun Project is the biggest platform that shares such pictograms, created and uploaded by graphic designers around the world. A pictogram can be a "doodle" than a "language", by lack of consistency.. Although applying regulation with a single standard as ISO 7001 is the simplest answer, it's not always an available option -- especially regarding that a pictogram is ultimately another form of creative expression. Also, they're rather recommended to be different in their level of details, scale or weight, depending on their purposes and environments. However, at least inside one system (i.e. 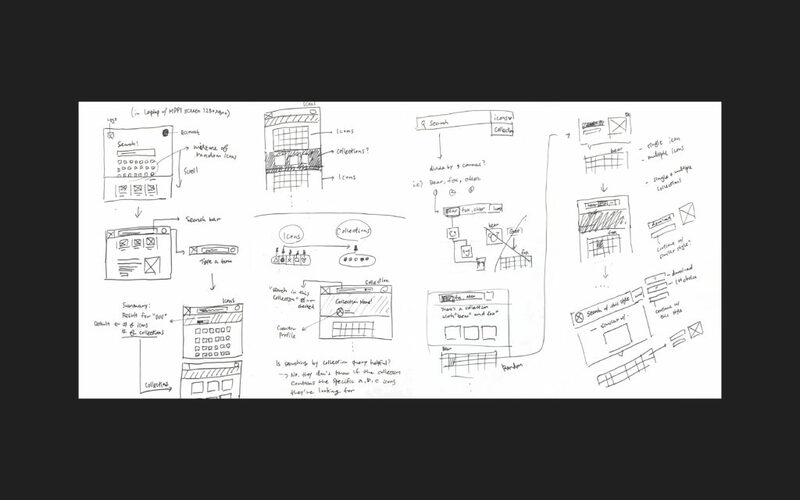 a mobile application), they have to align together; else they become mere doodles. When people open a website or enter into a building, they're entering into a new system. Something that can improve and build the legibility of pictograms is the consistency within a system, instead of the consistency over all the systems (like ISO 7001). It's much more achievable and friendly approach for keeping pictograms as a language, without destroying their diversity. It will also give a nice observation of how people visually perceive things and interpret them.